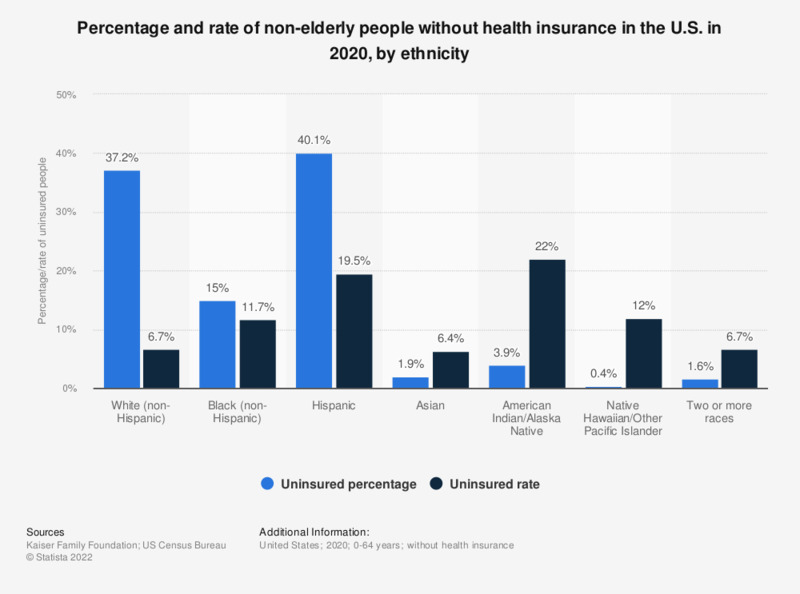 This statistic depicts the percentage and rate of non-elderly people without health insurance in the U.S. in 2017, by ethnicity/race. In that year, almost 37 percent of all uninsured were Hispanics, while the uninsured rate within the same group was nearly 19 percent. * Respondents can identify as more than one racial or ethnic group. The hierarchy we use for determining racial/ethnic categories places all respondents who self-identify as mixed race who do not also identify as Hispanic into the "Two or More Races" category. All individuals who identify with Hispanic ethnicity fall into the Hispanic category regardless of selected race.